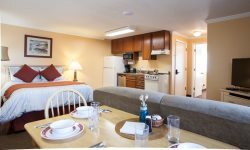 We have stayed with Cannon Beach Vacation Rentals each of the last three trips to Cannon Beach and we love their service. The staff is always friendly and nice the properties we have stayed at have been great. We usually have a big group staying so it's nice to have everyone at the same location with big family areas we can all gather in. This was our 4th year for staying at Sunset Retreat. The view is stunning and the backyard a convenient place for lawn games and campfire. However, this was offset by the fact that the stove and dishwasher were not working well. The dishes had to be washed by hand after going through the dishwasher cycles. When you have a house that sleeps 10, plus another couple of visitors, the stove and dishwasher are essential. We appreciated that the owners have made substantial improvements over the last couple of years: replacing the decking and removing carpets and adding new wood floors. We are so glad you have come back to Sunset Retreat repeatedly. Yes, this homeowner has been working diligently to improve and upgrade the house. We are very sorry about the dishwasher and stove. Both have been repaired and ready for your return. Look forward to seeing again next year if not sooner!